In the world of search, Google towers above the rest. It’s the “industry standard” search engine that is relied on in most any instance (at least in the United States), and, let’s be honest: it’s for good reason. Google search is an amazing tool. But competitors are always going to be vying for search market share. And from time to time, there are going to be some great search engines that are actually worth using. DuckDuckGo may just be one of those competitors, especially if you’re looking for privacy that you may not get elsewhere. But DuckDuckGo has plenty more to offer searchers. 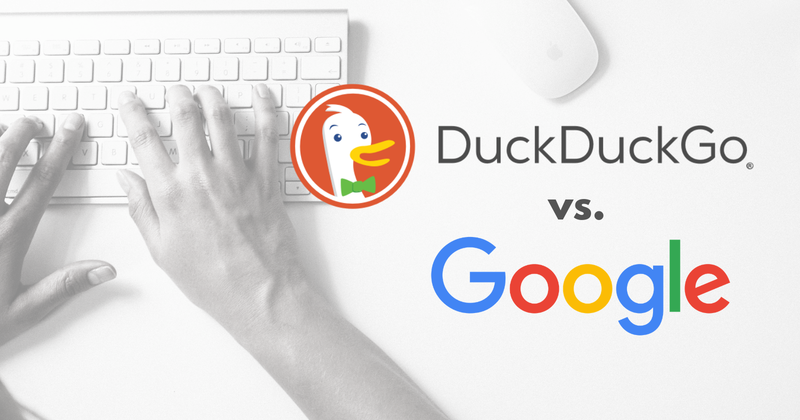 What follows is an in-depth comparison of the features of two great search engines we love – DuckDuckGo and Google. As we try to answer the question: which search engine should you use? Founded in 2008, DuckDuckGo claims to not store personal information of its users, ever. DuckDuckGo doesn’t follow its users around with ads since it won’t store their search history, won’t track their IP address, and essentially has no personal data to sell, regardless of whether the user is in private browsing mode. DuckDuckGo separated itself from the competition early and often in terms of the privacy it offers its users – that same privacy other search engines have refused to offer until DuckDuckGo. Just take a look at its Twitter feed if you want to find out how pro-privacy this search engine is. But beyond privacy, what else does DuckDuckGo bring to the table? DuckDuckGo uses its web crawler, DuckDuckBot, and up to 400 other sources to compile its search results, including other search engines like Bing, Yahoo, and Yandex, and crowdsourcing sites like Wikipedia. It also offers a Knowledge panel-like breakout box on the right rail with quick-access information for important details like name, address, phone number, website, etc., drawn from those above-mentioned sources, including Wikipedia (much like Google). DuckDuckGo pulls information from user-review site Yelp, including reviews, addresses, phone numbers, and business hours. Business-location directions are pulled from Bing Maps (by default), but this can be changed to Google Maps, HERE Maps, or OneStreetMap as the source (screenshot below). DuckDuckGo offers a number of other simple usability and/or preference tweaks that help simplify the overall process for the user, many of which Google implemented first – but not all of them. For instance, once a user has reached the bottom of a SERP, they can select to see more results, which opens up the next SERP directly below the current one (without opening a new page). It’s a simple difference but it does make the user experience a bit cleaner. Category Pages are one of my personal favorite features of the DuckDuckGo platform, offering category lineups with brief descriptions and images that are presented in a clean, enticing way. And, like Google (although not as extensive), DuckDuckGo offers Instant Answers (comparable to Google’s Featured Snippets), which are pulled from more than 100 sources around the web, according to DuckDuckGo. And, depending on which vertical you search with, DuckDuckGo will dynamically generate applicable search verticals. For instance, when you search a food or favorite dish, DuckDuckGo will trigger the “Recipes” vertical for you (screenshot below). DuckDuckGo also has a simple site-search command it calls “!bang syntax” that makes searching one website a lot easier (not that it’s never been done before). DuckDuckGo annual traffic did grow by 55 percent in 2017 and by 56 percent in 2018 – with just under 6 billion searches in 2017 and more than 9.2 billion in 2018. That number is obviously expected to grow, too – but to what extent, we don’t yet know. If it keeps growing at this rate, though, more people will continue to take notice and more people will join in. A staple of its foundation, DuckDuckGo preaches its desire to not track any information of its users or their searches, and prides itself on offering the most private search engine on the market. Its clean interface and simple user experience make using the platform a somewhat-unique search experience. Usability seems to be a primary focus, and it shows. It’s also aesthetically pleasing while still following the basic concept and layout of other search engines. The more users, the more profit, the more resources = better search engine. It’s the mom-and-pop version of a search engine, while Google is the premium gold standard. DuckDuckGo simply doesn’t have the resources of big, long-standing search engines. But it’s getting more every year, including a $10 million investment at the end of 2018. DuckDuckGo only owned .22 percent of total search market share in 2017, which is less than Ask, Yandex, Baidu, and all three “major players” in the United States (Google, Bing, and Yahoo). This means there is room for a lot of growth, but it needs to sustain its increasing popularity for years to come to gain significant market share. Features, ideas, and practices of DuckDuckGo are going to (for the most part) shadow Google (including doing the opposite of what Google is doing in terms privacy). This isn’t out of the norm for other search engines; they’re all chasing the big dog, Google. To start, it’s the most robust, vast search engine out there in more ways than one, with a family of tools and databases to accompany it and support its mission of delivering the most relevant, credible answers quickly and easily. For instance, owning a tool as powerful as Google Maps, which boasts a plethora of significant information for businesses across the world – from names, addresses, phone numbers, and websites, but also business-related photos that include interiors, exteriors, and everyday interactions – puts Google in a good position for success at its core. We know Google tried to establish a human network with similar, useful information in Google+, which is Google’s latest victim of the chopping block. While this was a futile effort in the end, it illustrates Google’s dedication to, not just improving search, but owning and building high-quality vessels to improve it through its platform. Like DuckDuckGo, Google offers specific search verticals to help simply searches, but with more options. There are additional search settings and tools that can be used to further refine searches (shown below). “The Google Search index contains hundreds of billions of webpages and is well over 100,000,000 gigabytes in size,” Google says. This is, by far, the vastest of search engine indexes. And it’s one of the main reasons Google is the dominate player in search. It isn’t just the largest search index; it’s also the smartest. Google is constantly making updates to its algorithms and ranking signals, including the addition of artificial intelligence via RankBrain. This machine-learning mechanism is another reason Google dominates and delivers, with no competitor close in sight. This is a playful statement based on Google’s incredible ability to identify search queries – and their answers – from unique long-tail searches without some of the most important piece of information. For instance, finding a film about a particular person or place without knowing the name of the movie, year of origin, or other seemingly critical information. When I look for a 1980s skateboarding movie with a name I don’t know but remember the main character has blonde hair, Google delivers me the answer I am looking for right in Position 1. The movie I was looking for is, of course, “Gleaming the Cube” with Christian Slater from 1989. There are other popular entities that Google owns that contribute to making it the powerhouse it is, like YouTube, Gmail, Play, and AdSense, and so on. It also boasts one of the best (and free) tool suites for productivity that includes Sheets, Docs, Slides, Calendar, and more. That’s not to forget Google’s free tools for webmasters and marketers, including Google Analytics and Search Console. And while it is the biggest and best search engine out there, it doesn’t change the fact that Google is, in fact, always extracting information from its users and applying it where it can for the gain of the company and/or the people paying the company for the extracted user data and/or advertising. It’s no secret that Google is doing this, so it’s not “ethically” wrong; it’s just not known by the majority of users exactly what data is being used, what it’s being used for, and why it’s being used at all. This has allowed Google to become one of the richest companies in the world, and it’s much ado to its targeted advertising sold on its own platform and through its many partners. That still doesn’t change the fact that it is the best search engine out there. That’s actually exactly why it has become one of the most successful companies: the quality of its search platform. Google has and will continue to accomplish feats other companies – including search engines – simply aren’t able to yet, if ever. It’s a superstar brand that has been, not just in the thick of search since its inception, but pushing it to new heights anytime it can, and before all of its competitors. Google has the largest search index, the smartest search engine algorithm, and the largest portfolio of free tools that all fit right inside its search engine. Yeah, it’s basically the same as the two points above. But it’s what truly matters. Google is the best and has been for quite some time. And it has changed every American’s life since its launch in 1998. It will continue to be ingrained in our lives for many years to come. Google also has the largest ad network, too. That’s thanks to data its compiled from its users and their behavior. On the organic side, Google treats personalization as a benefit to the user, but that’s all achieved through data collection as well. Google is always testing features and changes, big and small, to try and get an idea of what works best. Sometimes, Google will change things and, afterwards, it doesn’t seem like it was a change for the better. But, that’s Google, and sometimes the changes (or lack of commonsense features) leave webmasters, marketers, and searchers scratching their heads. While it’s impressive in most everything it does, Google’s full-blown launch of its Featured Snippet attribute led to a lot more “noticeable” wrong or misleading answers. In trying to provide its best (and often auto-generated) quick answer for simple questions, Google sometimes has pulled incorrect information (on a wide range of severity) that still shows the computer can’t always outsmart (or out-do!) humans. I used Yahoo mail for that long because I liked how it operated (until I had my account hacked, then said hacking was covered up) and I was comfortable with it. As a news-junkie and newspaper reader, Yahoo’s front page always enticed me to stick around, scroll, and read. And the stories are tailored to the user, so I was being served content I should and would eat right up. Without at least scanning through and, I’m sure, storing some – if not most – of my user data, that Yahoo homepage would have never had been as successful as it was in terms of grabbing my attention and piquing my unique interests to read a bunch of content there daily. And I knew that after the first 12 years or so. More importantly, I didn’t mind because it worked for me. So, what does Yahoo have to do with whether you should use DuckDuckGo or Google? What works best for you is the right answer here. It’s all about preference. Both search engines can likely get you the answer your looking for, and in a time-efficient manner. Anyone who is passionate about privacy would likely lean toward – and prefer – DuckDuckGo solely for its strong privacy policies but also since it is a better-than-average search engine trying to do right for the people. And it does a strong job in achieving that. That doesn’t change the fact that, if you can’t find an answer on DuckDuckGo, you’re going to go to Google to find it. And you will find it there.